By Amanda Tonoli | May 1, 2018 at 12:00a.m. Youngstown State University’s Puppy Palooza attracted stressed-out students to frolic with furry friends. 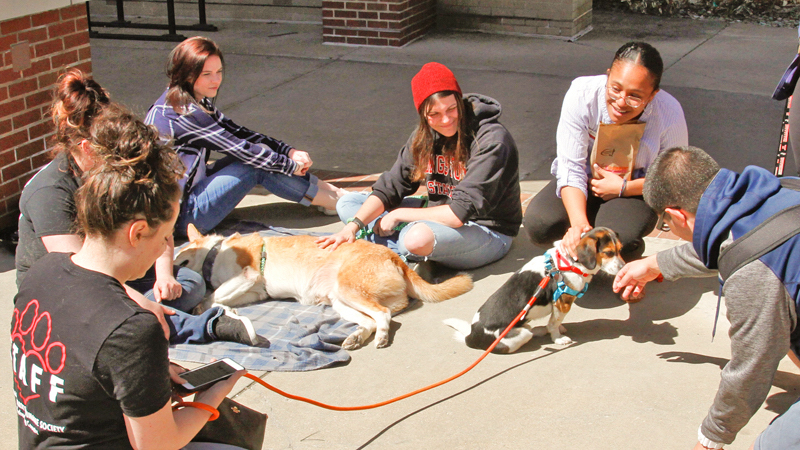 From 10 a.m. to 2 p.m. Monday, students were welcomed to the awning outside Andrews Student Recreation and Wellness Center to play with Animal Charity Humane Society’s dogs for an end-of-the-semester celebration – and to help relieve some stress during finals week. It’s a semiannual campus event. Alyssa Kubec, freshman, said she likes seeing this practice on a college campus. In addition, the dogs provide a nice way to spend free time while on campus, Kubec added. “You can just come sit with them in your down time,” she said. Junior student Alice Davis appreciates furry frenzy for an entirely different reason. Davis said she has that kind of stability at home, too, with a Savannah cat, a tabby cat and a corgi. To further that emotional stability, Davis said she normally wears cat ears for comfort and as a part of her personality. She left the ears off Monday because she didn’t want to upset the dogs. But for some students, it’s just a simple love of the animals. Sophomore student Megan Gocala said she just loves the atmosphere. “I love dogs and love being able to have them be a part of my day,” she said. April 30, 2018 10:55 p.m.
April 12, 2018 12:01 a.m.